The weather is warming up, the days are getting longer and everything looks so vibrant and colourful. Feels like all my senses are coming alive. The jasmine that covers our fence is in full bloom. Each time I step outside I can smell it. Hanging out the laundry has suddenly become a pleasant experience! 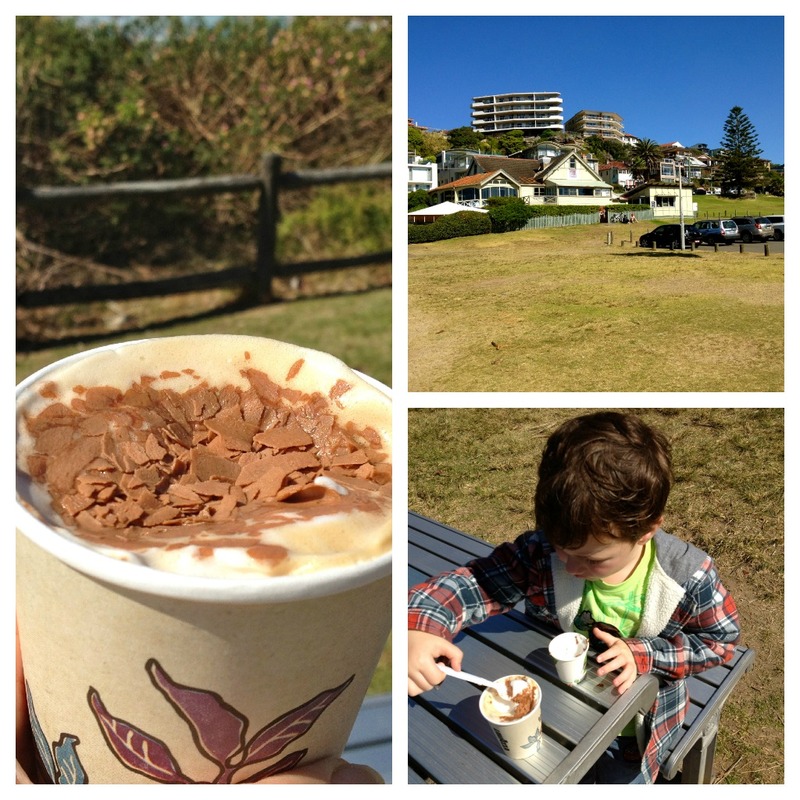 The track leading to Manly beach goes right past our house. But suddenly it’s so alive! The scenery I’ve taken for granted all winter has me slowing down to take it all in. 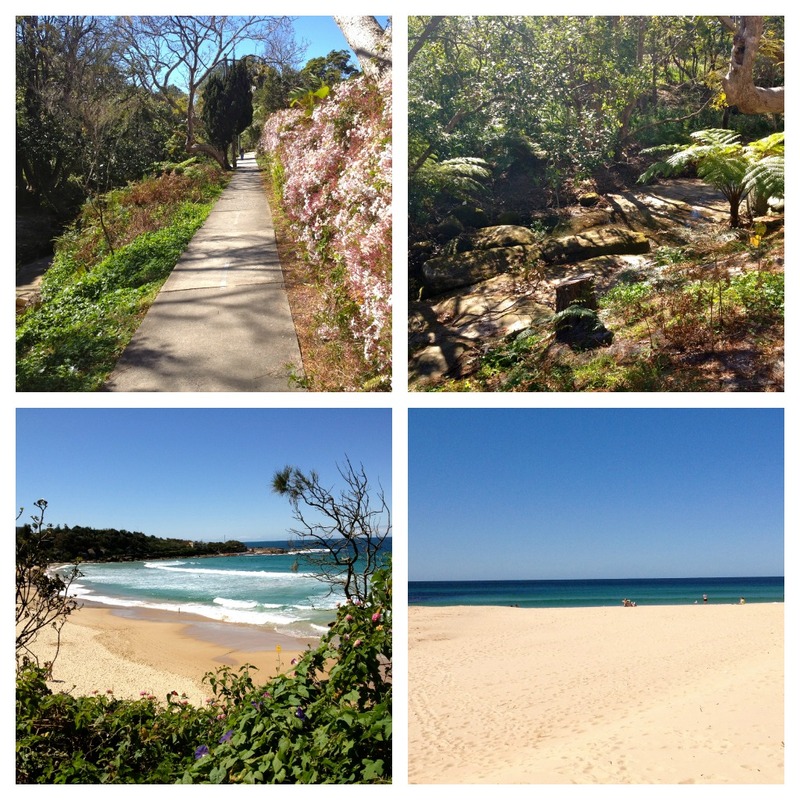 I walked to Manly and then continued on to Freshwater beach this weekend. I stopped for a cappuccino at the kiosk attached to the very popular Pilu restaurant (upper right hand pic below) while I waited for my husband and kids to meet me. They made my cappuccino with real chocolate flakes! A perfect way to finish my walk! The spring light and sunshine had me inspired. 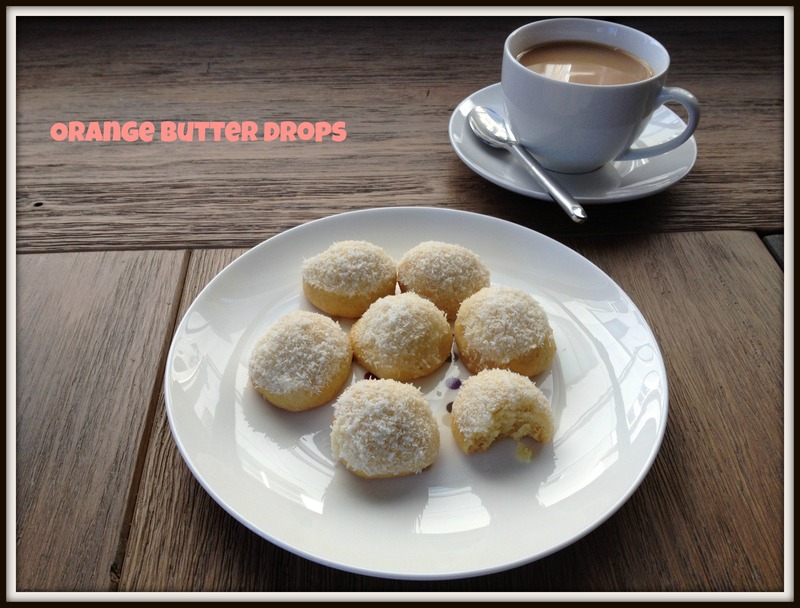 After a leisurely lunch at Dee Why beach I couldn’t wait to get home and make these Orange Butter Drops with Shredded Coconut from my latest crush, my One Girl Cookies cookbook. I’ve had my eye on these cookies for a while now and today was the perfect day to make these little bursts of sunshine! My little monkey and I made these in no time and my friend arrived as I pulled them out of the oven. We sat around the kitchen bench dipping them into the orange and cream cheese glaze, then the coconut and then straight into our mouths! They were incredibly pretty to look at and tasted delicious! 1. Put the granulated sugar and the orange zest in a medium bowl. Using both hands, rub the sugar into the orange zest. Put the mixture in the bowl of an electric mixer fitted with the paddle attachment, and add the flour and salt. Mix on low speed for 30 seconds. 2. With the mixer running on low speed, gradually add the pieces of butter. When the mixture begins to look like crumbs, add the vanilla. Gradually add 2 tablespoons of the cream cheese. When the dough starts to clump together, turn it out onto a lightly floured work surface. Knead it by hand for a few seconds until it is fully combined. 3. Preheat the oven to 350 degrees F or 180 degrees C.
4. Scoop out a small round of dough, about 1 1/2 tablespoons in size. Roll the scoop into a ball, place it on a parchment paper-lined baking sheet, and gently press the ball. Repeat, leaving 1 inch between cookies. Bake for 14 to 16 minutes, or until golden around the edges. Transfer to a wire rack to cool. 5. Prepare the glaze: In the clean bowl of an electric mixer fitted with the paddle attachment, combine the remaining 1 tablespoon cream cheese, the orange juice, and the confectioner’s sugar. Mix on low speed for 30 seconds. Increase the speed to medium and mix for 2 more minutes. The glaze should be as thick as glue. 6. Spread the coconut on a plate. Dip the top of each cookie into the glaze, dip into the shredded coconut (I used dessicated coconut), and let set for 20 minutes. 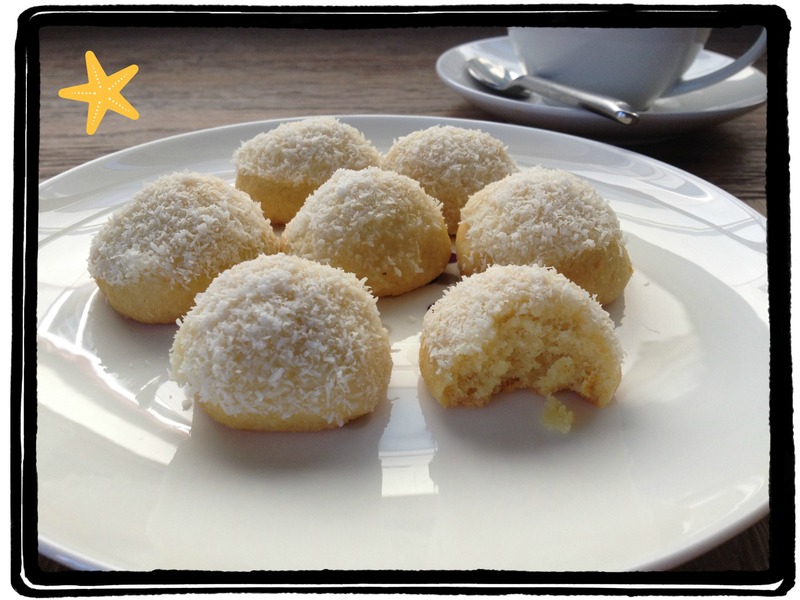 Tags: baking, biscuits, cooking, food, inspiration, life, my life, recipes | Permalink. You know how sometimes we see ourselves a certain way, but when we tell others, they look at you with that “you’re kidding yourself” look? Well I usually manage this with my own “you don’t what you’re talking about” look as I turn (and in my mind) graciously walk away. And it’s worked beautifully. Until recently. I think it’s the kid’s fault. I find things I say to them come back to haunt me at the most inconvenient times. Things like focus, sit still, pay attention. All things, that I now realise, I struggle with on a daily basis! For a while, I was convinced I had some form of adult-onselt undiagnosed ADD. There was no way I could pull off what I was asking the kids to do! I get up and start walking around any chance I get. I start something and half way through it I decide to do a load of laundry. My saving grace is that I don’t stop until I’ve finished all my half started jobs. So at the end of the day, what looks like chaos, somehow manages to come together in an efficient climax! I realised however that my attention span issues were across the board. Especially when it came to food. I have never been able to eat too much of anything. But alternate tastes between salty, sweet, sour and spicy and I can pick for hours! Like dipping salty, sesame pretzel sticks into Nutella. Best ever! Or black forest cake, the sour cherries cut through the chocolatey sweetness perfectly! And while I am not much of a biscuit fan, the idea of black forest biscuit caught my attenion. 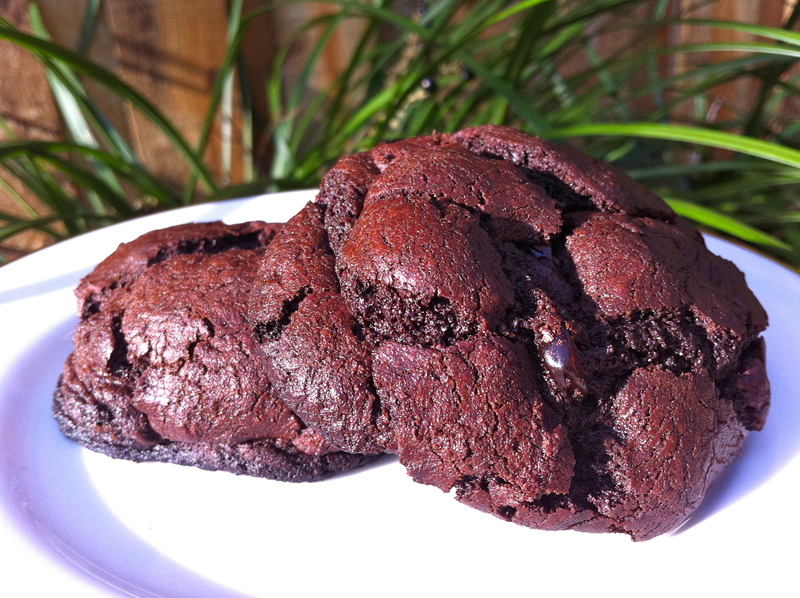 The recipe came from a new book I had recently bought, ‘Bourke Street Bakery – the ultimate baking companion’. And my goodness these were good! The burst of sourness in all that sweetness kept me coming back for more. The recipe is exactly as it appears in the book but I doubled the amount of cherries in my version. 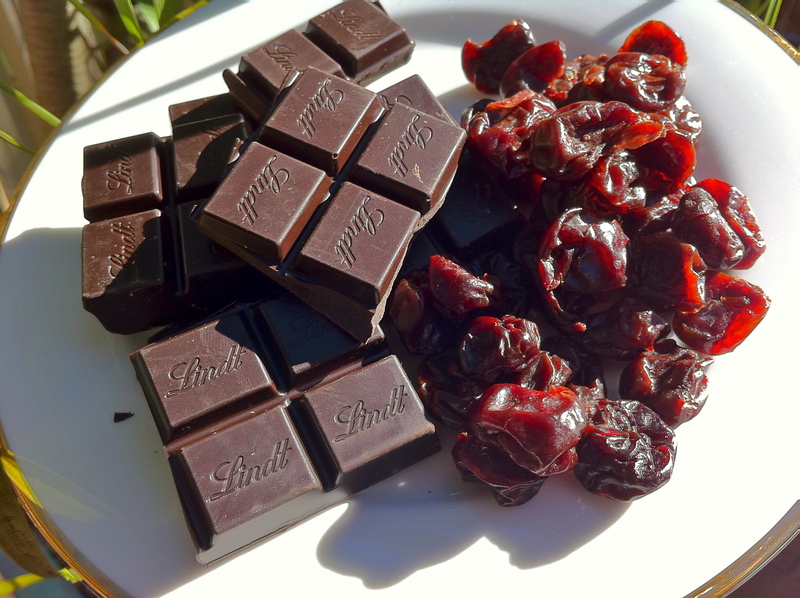 Put chocolate in a stainless steel bowl and set over a saucepan of simmering water, making sure the base of the bowl does not touch the water. Allow the water in the saucepan to boil for 2 mins then turn off the heat and stir the chocolate while it slowly melts. Sift the flour, cocoa powder, baking soda and salt into a bowl. Put the butter and sugar in the bowl of an electric mixer fitted with a whisk attachment. Whisk on medium speed until pale and creamy. Add the eggs, one at a time, making sure each is incorporated before adding more. Add the dry ingredients in three batches, mixing well after each addition, then add the melted chocolate and mix until well combined. Remove the bowl from the mixer, then fold through the dried sour cherries. The mix can become quite sticky, so you may need to refrigerate it for 15 minutes before shaping the biscuits. Take 3 tablespoons of mixture at a time and roll into even-sized balls – you should make about 12 balls in total. Place the balls on baking trays lined with baking paper, allowing room for them to spread. Refrigerate for a further 30 minutes, or until firm. Bake in batches, for 15-20 minutes each, or until risen and quite cracked on top. Cool on the trays and eat, or store in an airtight container for up to 3 days. Tags: baking, biscuits, chocolate, cooking, food, recipes | Permalink.